Formula 1000 was designed to be an inexpensive way to go racing at speeds well above 150 mph. The NorthAmF1000 championship is designed in the same manner, allowing only factory stock 1000cc super-bike engines with factory number matching ECU and throttle body. report directly to designated impound area for a minimum of 30 minutes. by series designated tech inspectors. Competitors who are determined to be in violation of any rule may be disqualified. The series may disqualify a driver from a session, event, points, and/or prizes. 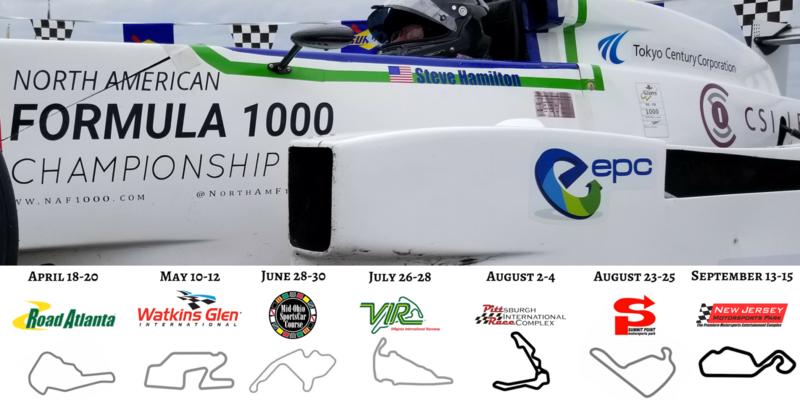 the full contingent of F1000 drivers entered in the event. within 30 minutes of disqualification notification. All tires for F1000 championship events must be purchased and serviced by Hoosier Pro Racing in Indiana. dry weather Hoosier Racing Tires per weekend event. All Tire orders must be in no less than 14 days prior to an event. Drivers count their 10 best finishes towards the championship. at least half the laps of the winning car. Scott Young Enterprises Fastest Lap. Highest finishing car type in each event earns points for their respective manufacturer. 2019 Series and sponsor decals and patches are available through the mail upon request, or will be distributed at first event. An advisory committee has been established to discuss and advise the series and its drivers on issues regarding operation of the series. The committee shall consist of any registered series driver, car owner, manufacturer, or interested party, approved by the series, who has the interest and time available to devote time to the detailed analysis of all issues regarding the operation of the series, and who may request to be members of the committee. The committee shall establish its own rules for orderly meetings. The committee shall consist of no less than 4, selected on a first request, first approval basis. The committee shall meet quarterly via tele-conference, and as-needed to resolve time sensitive issues. A minimum of 4 members is required to hold any advisory committee meeting. All members will be notified via e-mail from the series a minimum of 7 days prior to any meeting. A majority vote of the committee shall be required before any recommendation can be passed to the series and/or drivers. All recommendations shall be in the form of an email with advisory committee member vote counts included. Following advisory committee recommendations, registered series drivers and entrants shall be given the opportunity to vote on the issue(s). Following any vote, North Am F1000 series will take the appropriate action to attempt to resolve reasonable issue(s). All committee meetings are recorded and available to all series participants upon request. is owned and operated by North American Formula 1000 Championship LLC.